The 2011 Quicken Loans Carrier Classic trophy. (Huntington Ingalls Industries)The winner of Friday night’s Quicken Loans Carrier Classic basketball game will walk away with its first victory of the season, some bragging rights (we won at sea!) and a very unique trophy. The 86-pound trophy – you read that right, 86 pounds – is the result of eight weeks and some hard work by a creative team of 30 workers with Newport News Shipbuilding, a division of Huntington Ingalls Industries. A group of them traveled to San Diego for the Michigan State–North Carolina game, with the trophy securely packaged for the cross-country trek. LaMar Smith, a graphic designer with the Newport News, Va., shipbuilder, came up with the idea for the trophy. He wanted to incorporate the aircraft carrier Carl Vinson – the game’s host – into the design and have the carrier’s signature look – the ship’s tall island house, or superstructure – as the focal point. “It works well in a trophy,” Smith said. 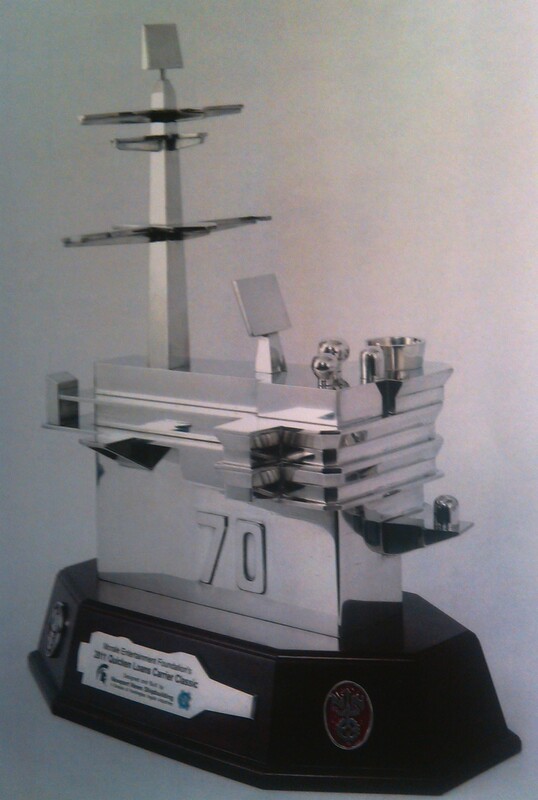 And in honor to the ship itself, the team designed the Vinson’s hull number – 70 – into the trophy. The team fashioned the trophy with 17 pieces of quarter-inch-thick pewter and placed it atop a teak base, stained in red mahogany and finished with a lacquer coat and fashioned with a pewter cutout of the ship itself. “Pewter looks good,” noted engineering designer Paul Evans, who took 3-D scale models of Vinson’s island and sketched the patterns for the mold. Pattern maker Lance Pruitt helped make the full-scale wooden model the team used to create the pewter trophy. Despite the trophy’s heavy weight, Pruitt said, “it actually is hollow inside.” It will require more than a pair of hands to carefully move the trophy and present it to the winning team. No predictions, however, whether the winners will haul the trophy onto their shoulders or above their heads in celebration.